When sending out an invitation via email, there are two choices: Single-Use Link or Multi-Use Link. Depending on your goals and participants, each method has its benefits. Make your choice, then prepare and publish! Each Single-Use Link only allows a single response. Single-Use Links should not be sent to group email addresses. These invitations should not be forwarded. Select Single-Use Link under the Publish by Email column and click Continue on the bottom of the screen. In Select Email Message, review the Email Messages created under Email Templates. If you’ve chosen to edit, complete any changes before continuing.You can also embed a question from the survey by enabling Embed a Question from the menu on the left and selecting the question you want to embed. Only Radio Button, Rating Scale, Smiley Rating and NPS questions can be embedded within an email message. In Source of Email Addresses, choose your preferred source. Touch Rules: SoGoSurvey’s Touch Rules makes it easy to avoid over-surveying by filtering out those who have recently participated, eliminating survey fatigue. Pre-populate Survey: This option will be pre-selected if the pre-population is applied on one or more survey questions. You may select the values to be pre-filled for these question on this step. In the Mail Merge step, provide values for the mail merge variable used within the email content. All email addresses will be listed with text boxes so mail merge values can be entered manually. If you are not seeing the Mail Merge step, you have likely not entered the mail merge code in the email content section. If you want to include these values in your message, return to edit your content and include these codes. In Send/Schedule Invitations, the approximate number of invitations to be sent/scheduled will be displayed. As desired, choose to send reminders to non-participants at automatic intervals, with different Email Message for each. Choose to schedule reminders 1-7 days from the original invitation. Scheduled reminders are automatically cancelled if responses are submitted. Choose to expire invitations at a set date and time. Use this feature when the survey will remain active but the invitation should not. Expiration dates can be viewed and modified from Track Survey. Finally, once everything is set, you can choose to send invitations immediately by selecting Send Now or schedule them by choosing Schedule for Later. Send Intelligent Reminders to non-participants. Multiple/duplicate participation (ballot box stuffing) cannot be prevented. Select Multi-Use Link under Publish By Email and click Continue on the bottom of the screen. If you’ve chosen to edit, complete any changes before continuing. 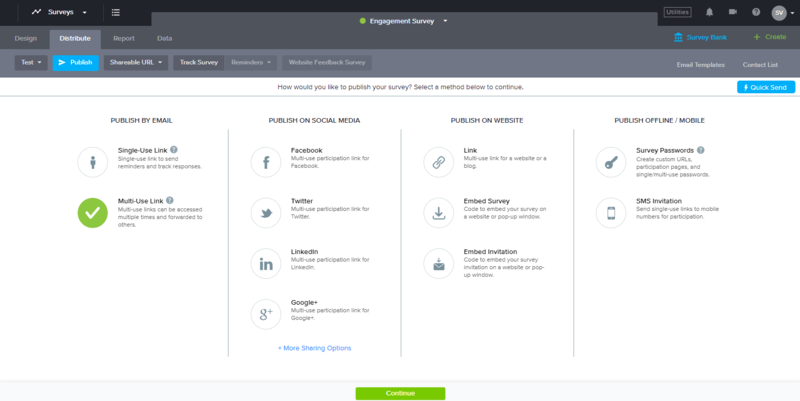 You can also embed a question from the survey by enabling Embed a Question from the menu on the left and selecting the question you want to embed. Scheduled reminders are automatically canceled if responses are submitted.